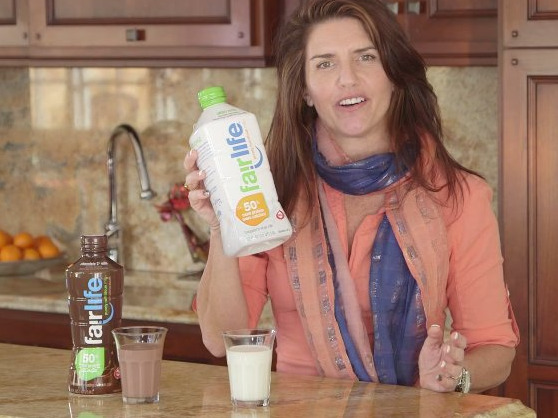 The product is called Fairlife and it will sell for twice the price of regular milk when it hits store shelves nationally in December, Coca-Cola’s North American chief, Sandy Douglas said at Morgan Stanley’s Global Consumer Conference last week. “It’s basically the premiumisation of milk,” Douglas said. The milk doesn’t contain lactose and it has 50% more protein and calcium than regular milk, as well as 30% less sugar. FairlifeThese are some of the advertisements for Fairlife milk. Fairlife is “a milk that’s premiumize and tastes better and we’ll charge twice as much for it as the milk we’re used to buying in a jug,” Douglas said, according to a transcript of his remarks. This is the beginning of a long-term investment in the dairy business for Coca-Cola. Coca-Cola’s investment comes at a tough time for the milk industry. Fluid milk sales have been declining for the last four decades.